Can I Save Homemade Pickling Juice & Brine? 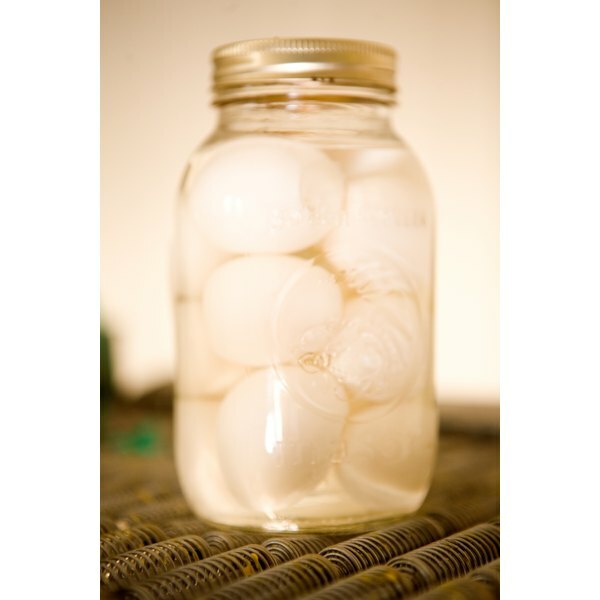 Pickled eggs were once a common barroom snack. 1 Can I Make Pickled Eggs by Putting Boiled Eggs in Pickle Juice? 3 Can I Save Homemade Pickling Juice & Brine? Pickled eggs are very easy to make and a great way to use an abundance of eggs that are about to go bad; they are also a great way to use up leftover Easter eggs. The spicy, tangy bite of brined eggs is traditionally complemented with cold beer. Place a dozen or more eggs in a large pot, cover them with water and bring them to a boil. Allow the eggs to boil for about 15 minutes. Drain the hot water from the pot and fill ut will cold water to cool the eggs. Peel the eggs once they are cool enough to handle. Place the hard boiled eggs in a clean glass jar. Fill the jar with vinegar. Pour the vinegar from jar into a large pot, Add 5-6 peppercorns, 1 tsp sugar, 1 tsp salt and two whole red peppers. Bring the vinegar and spices to a boil. Silce 1 or 2 onions (depending on their size) into large, thin pieces while the vinegar and spices are boiling. Put the onion slices in the jar with the eggs. Strain out the peppercorns and red peppers after the vinegar begins to boil. Pour the spiced vinegar brine into the jar with the eggs and onions. Allow the eggs to cure in the brine for at least a week before you consume them. Add hot peppers the brine if you like your pickled eggs spicy. Be careful when boiling vinegar, as the vapors are very pungent.